Cruise Crewmembers Share Their Experiences On CruiseJobFinder! 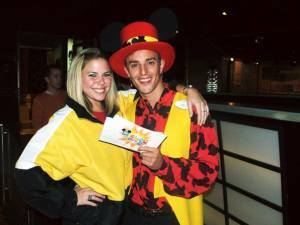 This is Part II of our interview with Joe L., who held the position of Entertainment Host for Disney Cruise Line (DCL). See Part I of the interview, which goes into more depth about entertainment jobs with DCL. What were the most challenging aspects of your job as an Entertainment Host? The long days - 10 hours a day, seven days a week can be tough. Living with your colleagues can be challenging and being away from your family and friends can also be difficult as you're quite inaccessible at sea. But it just depends on how you handle those things. Personally, I was very comfortable with it. You got into a routine of doing different duties on different days of the cruise. Normally there was an early start - getting people off the ship for excursions from 8am to 11am, making sure they knew what was going on, where to go, and had everything they needed. In the middle of the day you would have some small activities, training, rehearsal or safety training, such as life raft or lifeboat classes and from 6pm to 12pm you would host shows. These included gameshows, karaoke, bingo, music, comedy, variety acts, and dance parties and you would be paid to socialise with guests. How much you can expect to earn? Do you receive commission or tips? I was not in a tipped position but I earned close to £2,000 a month. Yes. If your personality is right - definitely. Thinking back on your job search, would you have done anything differently? No, it worked perfectly for me, but others may have wanted to know exactly what they were walking in to! Everyone on the ship was very friendly, open and helpful from day one. On a ship you have to all pull together. You work together and play together and that bond is one of the huge bonuses of working in the industry. You are a family and most of the time it feels like it. What was your favorite port and why? I liked Cozumel, because I swam with the dolphins with my with my girlfriend - now my wife! - there on our first date! I enjoyed the variety in and around Europe, but the Caribbean and Mexico is where I loved most. How did you spend your time off duty? Depending on the contract, I'd either sleep, explore or just hang out with friends off the ship at places we'd found on previous cruises - you can really get to know the ports and the best places to shop and eat if you go there each week. What were the terms of your employment? My contracts ran for five to six months at a time. When your contract's up, how did you line up more work? Unless told otherwise, at the end of your contract you are invited back after a six to eight week unpaid holiday period. Would you recommend this line of work? I would recommend it to others and have done, just for the people you meet and experiences you have, good, bad or otherwise. You will always come back with stories to tell. What's the best advice anyone gave you about working in this industry? Be open to everyone and learn about people. From the people you work with and the sacrifices they make; the people you meet on the ship, the people you live with, and the people in the places you visit. It will open your eyes and they help you get the most out of the whole experience - and you need them to help get you through sometimes. What are the passengers like? Passengers are normally really nice and excited to be on the ship. After a week on board you should have built up quite a strong bond with many of them, and things shouldn't be too formal. Some passengers will have challenges with things and maybe have a shorter fuse than others, but often that's an opportunity to make things even better and build stronger bonds with them. Even when working for so many hours it's not difficult to keep smiling and being nice to others - and that was probably the most important part of my job. They have entertainment, activities and events for crewmembers, just like guests. The Disney cruise has an onboard HR Department for crew whenever they need it and they are available for any issues. They have special crew events, a crew bar and special rewards - such as staying in ports late so crew can have "more fun" if they reach certain standards. Do you think working on cruise ships developed you as a person and will help your career on land? It's definitely developed my skills with people and has triggered a new career target - stand-up comedy, basing some of my material on stuff I tried out on the ship. Hopefully it will help a career in entertainment, events or tourism on land - if I moved back into TV, I would have more ideas to give after thinking about things on the ship. As a person, it's helped me find where I am supposed to be in life - it led me to the next step and helped get my priorities straight. It did a lot for me and changed me for the better. Are there career paths for crewmembers?